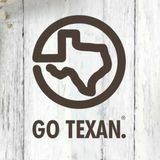 as shop for great gift items made right here in the Lone Star State. Hungry fairgoers will enjoy free yogurt from Southwest Dairy Farmers each day throughout the Fair. Thereâ&#x20AC;&#x2122;s also live music, exhibits and demonstrations taking place in the GO TEXAN Pavilion daily. balls, quail breast, edible colas and many more innovative treats. of creativity, resolve and purpose,” said James Harris, director of diversity and inclusion and supplier diversity for H-E-B. “As we celebrate the third year of competition, we have enjoyed the inventiveness that our fellow Texans continue to showcase.” The Quest for Texas Best competition drew entries from 101 towns across the state. Through two qualifying rounds, H-E-B business development managers judged submissions on taste and flavor, customer appeal, value, uniqueness, market potential and differentiation from current products at H-E-B stores. MAKING GO TEXAN PROUD Once again, GO TEXAN members made Grand Prize Winner ($25,000 and featured placement as a Texas Best Primo Pick): their way to the top of the competition, including as the grand prize winner. Texas Pie Company from Kyle Original Pie Dough Puck Among the 25 finalists, more than half Chef Julie Albertson are GO TEXAN members: Zen Monkey, GO TEXAN members since 2014 Since 1988, Chef Julie Albertson has Blank and Sons, Sandy Oaks Olive Orchard, Texas Pie Company, Trentino been crafting handmade pies, learning from her grandmother to use organic Gelato, MuffinElse, Erva Yerba Mate, Briggs TRUE Texas, Southern Blends, ingredients including fresh fruits, milk Lauren’s Garden, Sabrosos Salsas, Bagel and eggs. Today, her pies are famous Dots and Patti’s Place. for their homemade quality and farmfresh fillings. Using pecans from Texas Following is a list of the 2016 Quest for growers and a homemade crust recipe, Texas Pie Company’s Pecan Pie has Texas Best award winners. been the company’s number one seller for more than 25 years. First Place Winner ($20,000): Bagel Dots from Houston Purav Patel and Aarti Garehgrat GO TEXAN members since 2015 Have you ever wondered what happened to the center of the bagel? Aarti Garehgrat has the answer! Bagel dots are a truly innovative, fresh, new solution to the age-old problem that eating bagels is messy. These bite-sized bagel balls are filled with cream cheese and other ingredients of choice, and they are delicious, fast and ready-to-go. This wholesome snack can be eaten at any time and any place. First Place Winner ($20,000): KITCHUN from Austin Holy-Coco-Cacao! No-Grain-Ola Gloriana Koll and Keesha Waits Search no further for healthy snacks that will satisfy your cravings. KITCHUN is an unconventional brand of delicious foods made with chef sensibilities, including their famous No-Grain-Ola and Batch, and Please! cookie mixes, which contain no grains, gluten, soy, dairy or GMOs. These tasty, good-forÂ­you ingredients are put together in an unexpected way that tastes great. Second Place Winner ($15,000): Culinary Cowgirls from Austin Lone Star Queso Alexandra Worthington Culinary Cowgirls’ quesos are made by Texas chefs and loaded with allnatural ingredients to create spicy flavors like Lone Star Queso, Roasted Hatch Queso and Salsa Con Queso. Based in Austin, every batch is handstirred and overseen by the cowgirls who invented the recipes. This is not your momma’s queso, so saddle up and spice up your life with the Culinary Cowgirls. Third Place Winner ($10,000): Humble House Foods from San Antonio Ancho and Morita-Smokey Tamarind Sauce Luis Morales Influenced by the heart and dedication of family-owned farmers and ranchers in San Antonio, Luis and Marsha Morales established Humble House Foods with an emphasis on real food, real flavor and real sustainability. Using multidimensional flavors from dried, aged and smoked chilies, as well as real fruits like mango, papaya and golden raisins, Humble House Foods creates pesto, hummus and hot sauces focusing on the brand’s motto of Flavor First. BEAR CREEK SMOKEHOUSE: A GENERATIONAL BUSINESS NESTLED IN THE PINEYWOODS OF EAST TEXAS, BEAR CREEK SMOKEHOUSE HAS BEEN ONE OF THE LONE STAR STATE’S “BEAR” NECESSITIES SINCE 1943.
the office and assisting with, as she said, “a million other things.” She and her husband, Hunter, are raising the fifth generation of workers for Bear Creek Smokehouse. Their entire family takes pride in their work, and they enjoy working with the ones they love the most — their family. “On any given day, you can walk into the plant and there are four generations of Shoults men working,” Mrs. Shoults said. Shoults proudly admits that being a Texas business owner has truly been a blessing. “Being able to be in a network with other GO TEXAN members that we can reach out to when we need ingredients or guidance is comforting, and it’s a wonderful thing that GO TEXAN has made possible for us.” In the future, Bear Creek Smokehouse will release a family cookbook with more than 200 pages of family recipes. The company is also wrapping up the finishing touches on their new Signature Series Pork Tenderloin that Food Network’s Sunny Anderson has helped create. Community Beer Co. was considered an early entrant into the industry and immediately began winning prestigious awards for its beers, including gold medals at the Great American Beer Festival and World Beer Cup. Carr’s favorite thing about being a business owner, especially in Texas, is that Texas provides a wonderful climate for a wide variety of businesses and patrons that are yearning to go local. “There is a significant consumer shift happening in Texas where more folks are seeking out local offerings and are willing to pay more for the higher quality that local usually provides,” Carr said. “Not only is buying local a great way to help your fellow brethren in the state, but it also boosts our economy.” Prior to this year, Community Beer Co. beer was only available in North Texas, but now Community Beer Co. beverages are available in and around Austin and San Antonio, with more locations to follow. “We have lots of fun beer releases on the horizon, all the while planning some pretty big events to celebrate craft beer in Texas communities,” Carr said. The beer that celebrates the Lone Star State and best captures the Texas spirit is the brew, Texas Helles. “We are so proud of our fastest-selling beer, Texas Helles, which is an easy-drinking, refreshing, light German-style lager clocking in at only 5.0 percent ABV, which stands for alcohol by volume,” Carr said. For a list of places to get Community Beer Co. beer, click here. “The partnership with the Texas Nursery and Landscape Association and the Texas Water Smart Coalition provides our GO TEXAN Certified Retirement Communities with an opportunity to improve their amenities for retirees and residents alike,” Richard De Los Santos, GO TEXAN marketing coordinator, said. “This space also offers the public a chance to learn about water smart plants and provides our local nurseries a chance to increase business.” Six more communities will be receiving greenspaces soon, including Chandler, Seguin, Pottsboro, Rusk, Kaufman and Longview. Currently, there are approximately 50 certified GO TEXAN retirement communities. For a list of these communities and more information, click here. RECIPE: DIJON AND WHISKEY BEEF STEW Serves: four to six. Cook time: three hours total. Ingredients: ¼ lb. 1 3 4 tbsp. 2 lb. 2 tbsp. To taste	½ cup	2 cups	½ cup	4 tbsp. 4	½ lb. part of a very cool — and healthy — crowd,” said Texas Agriculture Commissioner Sid Miller. “As part of our innovative Farm Fresh Initiative, this live event provides valuable lessons about good nutrition and Texas agriculture in a way that children will connect with and remember for years to come.” Click here for a list of schools and child care centers that will be treated to the Jump with Jill Live Tour in the coming weeks. 17 and 18. Visit your local store to see if there is a demonstration near you this weekend. Below, try this delicious recipe using fresh avocados, Texas-grown squash and Texas Gulf shrimp. sliced Texas-grown green or yellow squash. and while you are visiting, check out the local restaurants and shops. Have you ever gone to a pumpkin patch in rural Texas and picked a pumpkin or worked your way through a corn maze? When you do, you will have created wonderful memories that will last a lifetime, and perhaps a few tall tales to share with your friends. As it gets closer to Christmas, plan a trip to harvest your own fresh tree from a Texas grower. Remember, all of these opportunities can be found just by some simple searches on the internet. Now go enjoy rural Texas! 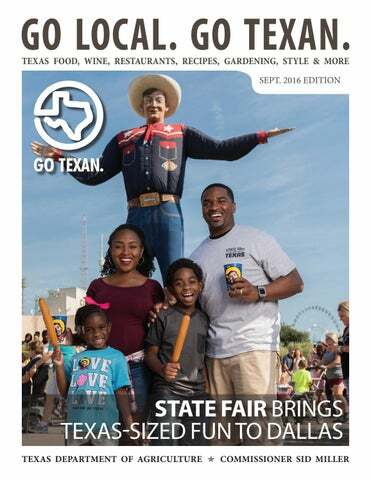 The latest information on Texas food, wine, restaurants, recipes, gardening, style and more.